If this column is your first exposure to Tiny Pencil then, just for you, let’s quickly sum up the TP adventure to date. 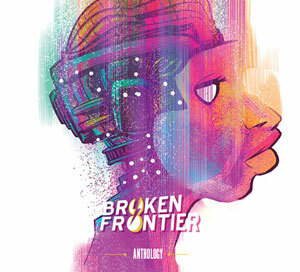 Debuting in 2013, this anthology was created with a remit to celebrate the “lead arts” through a combination of illustration and comics. 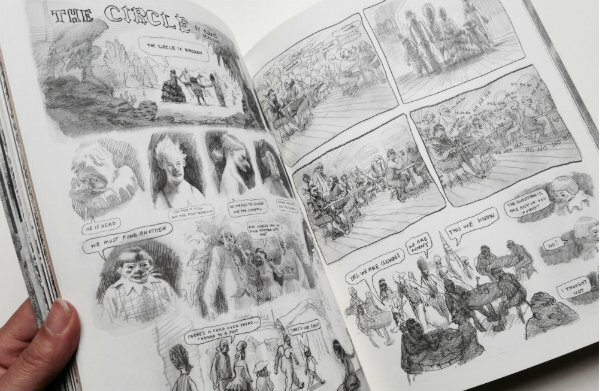 Each instalment represents an opportunity to be introduced to the pencil work of an abundance of international artists – there are nearly thirty in #4 for example (right, stunning cover by Allison Sommers) – and so far the book has described its interiors with the taglines ‘Into the Woods’, ‘Mammals, Monsters & Mars!’, and ‘The Beast Issue’. 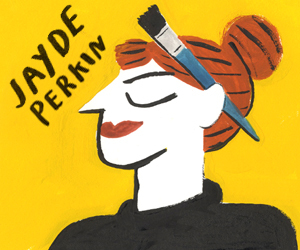 An instant draw this time round is that two of UK comics’ most idiosyncratic creators feature in #4 – Gareth Brookes of The Black Project from Myriad and S.J. Harris of Eustace from Jonathan Cape. 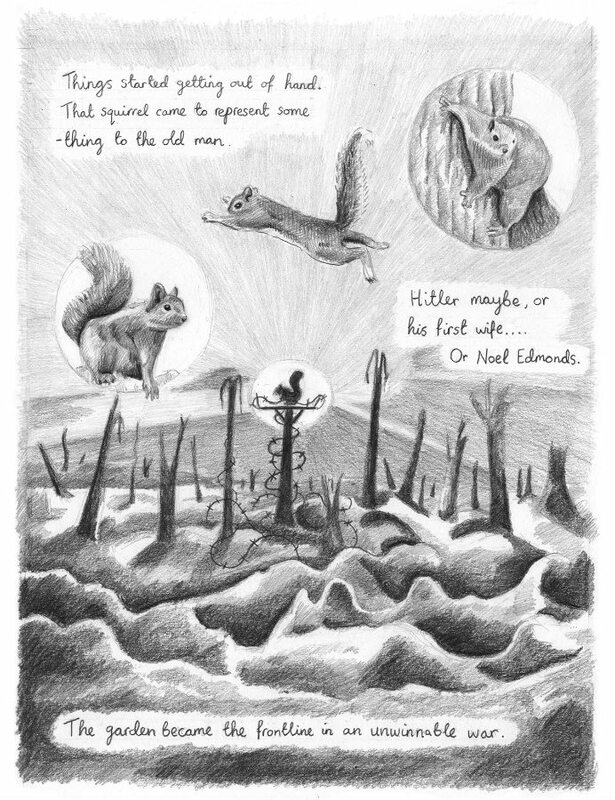 The deadpan humour that has always been an intrinsic part of Brookes’s work is very much in evidence his four-pager ‘Squirreled Away’ (below left), an account of a deceased grandfather’s previously ongoing conflict with a squirrel in his back garden over the sanctity of a bird table. It’s notable not just for Gareth’s dry wit but also his inventive use of the page, as minor backyard skirmish speedily escalates into some form of sciurine battleground. Harris, meanwhile, provides an examination of Victorian death portraiture (below right) that is oblique in narrative terms but no less emotionally resonant for that. The act of discovery is always one of the great joys of a multi-creator anthology and Isabella Mazzanti’s two-page offering depicting the circle of life through unconventional interpretive imagery certainly marks her out as someone to investigate further. 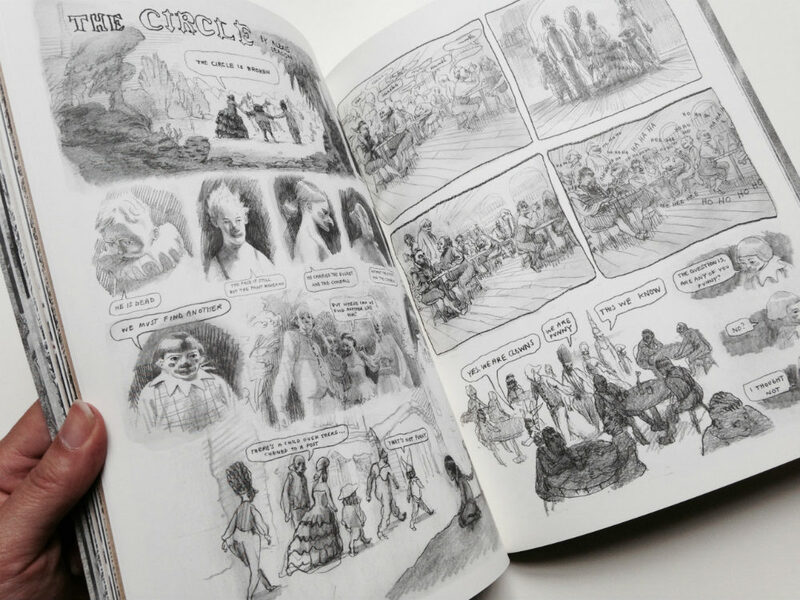 Of the other comics work here, ‘The Circle’ (below) – Alexis Deacon’s tale of a travelling troupe of clowns looking to induct a new member after the death of one of their company – manages to be somehow both understated and bizarre, droll and yet immeasurably sad. The character designs, in particular, are memorably crafted and Deacon shows exactly why his success in last year’s Cape/Observer/Comica short story competition was so deserved. The two absolute highlights though on the comics front in are Claudia Piras’s ‘Night of Bones’ (below) and Joshua Goymer’s ‘Unexpected Company’. 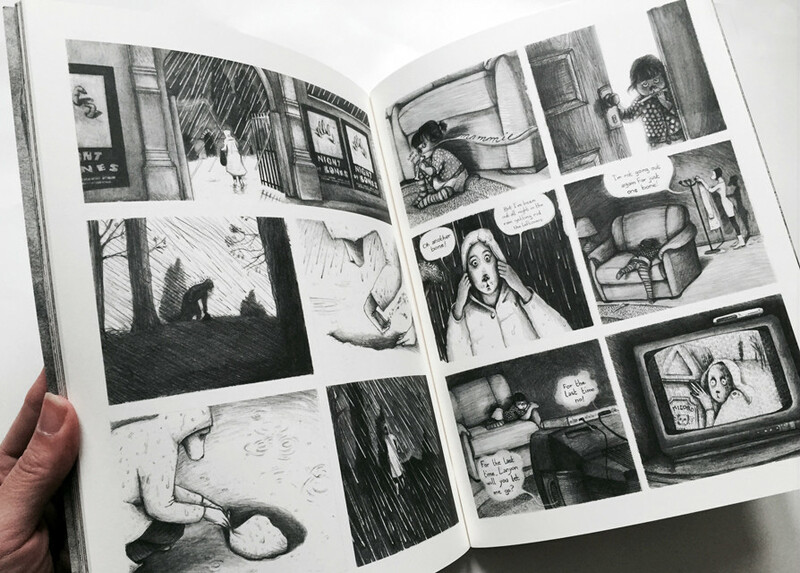 Piras weaves a story that drifts in and out of reality as a young child’s imagination is influenced by a melodramatic horror film. Her use of anthropomorphic cats as characters adds an extra unsettling layer to the proceedings with its unlikely visual juxtaposition of the cute and the feral. Goymer’s offering is an outstanding meditation on loss with something as seemingly inconsequential as a shirt in a laundry basket triggering a poignant moment of closure. The panel-to-panel storytelling is quite beautifully paced here. Of course comics are just one part of Tiny Pencil and the single illustrations are as vital a part of its mix as the sequential art. No one got quite as close this issue for me to capturing the dual themes of death and resurrection as Joanna Concejo (in postcard form in the top banner image of this column) while Yoko Tanaka’s eerie forest wake and Jun Cen’s slightly menacing representational mirroring of light and dark also having a lingering quality. This is by far the strongest issue of the series yet in terms of pure comics though, with a pleasing assortment of established creators and up-and-coming artists. 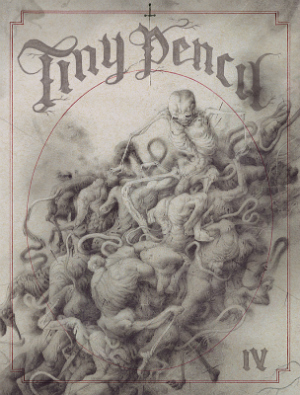 In its two-year life, Tiny Pencil has come to occupy a unique position on the small press scene, straddling the aligned worlds of comics, zines and fine art with confidence and poise. I can only imagine what a herculean task curating a project like this must be and it’s to Amber Hsu and her team’s absolute credit that, issue after issue, it’s such a consistently absorbing and immersive reading/viewing experience. For more on Tiny Pencil visit the website here. 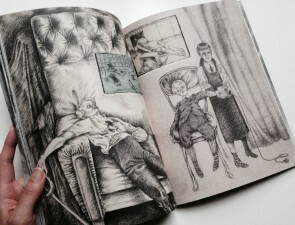 You can buy a copy of Tiny Pencil #4 on their webstore here priced £11.00. Oh wow, this is definitely top of the list for payday!